We often talk about how success companies host webinars regularly and share tips and tricks to help you grow your business and hold great webinars. But sometimes, we are the ones that learn from our customers who have found great success with their webinar programs. Over the last 18 months, Jeremy Koenig, Creative Director, at MobileCause, a VC-backed mobile software firm for non-profit fundraising, has committed to investing in a webinar program for their mobile and online fundraising solutions to spur a new generation of donors. But it hasn’t always been easy. “We’ve made every mistake in the book,” Koenig confessed. On top of making several mistakes early on, MobileCause also found that their leads were much more likely to download an infographic or an eBook than sign up for a webinar. On the surface, MobileCause’s webinars were not successful. It’s imperative when putting together a webinar program, that you know exactly what your goals are. Are you looking to increase your number of leads, shorten your sales cycle, reduce churn, or become thought leaders in your industry. Depending on your audience and the type of webinars you produce, your goals and KPIs should be specific. MobileCause decided on a two-fold goal. They wanted to shorten their sales cycle and become thought leaders in the non-profit fundraising space. After committing to a webinar program despite their doubts due to disproportionately fewer leads than with other content initiatives they found that 50% of their customers who signed up in a month had attended a webinar first. Webinars are a fantastic way to spread your industry knowledge and become an authority in your space. But few potential customers what to attend a Webinar where they are going to be sold a product. They attend because they want to learn and get better at their craft or find solutions to problems they have encountered. In their webinars, MobileCause has been sharing expert in demand fundraising advice to nonprofits by being on the forefront of trends. “Answer the questions people are asking,” Koenig stated about how to pick a webinar topic. You can find what is being asked by looking through your website’s Keyword data, see what’s trendy on social media or even what other webinars in your space are talking about. In MobileCause’s research, they found that Millennials are less likely to respond to traditional fundraising efforts, instead they are more likely to respond to SMS, Social Media or mobile friendly registration forms. They also were quick to see the opportunity that Facebook Live could present in the fundraising space, as it’s an easy way to host a worldwide event at zero cost. Teaching their audience about these methods, while showing examples that used their product helps create a more informed lead that felt they genuinely benefited from the webinar, whether or not they sign up for MobileCause. In one month, Koenig recalled receiving 6000 leads. Only 1000 of those leads were from Webinars, but 50% of those that became customers had attended a webinar. Their sales team reported having shorter conversations as the value of the product was clear to those that attended the webinars. This proved that MobileCause had met both of their goals, shortening their sales cycle and becoming thought leaders. Webinars are now a permanent part of their marketing stack. Putting together your own webinar program is a fantastic way to grow your business. On the AnyMeeting blog we have talked about about the importance and steps to securing guest speakers or improving audience engagement. However, there is one aspect of webinars that we haven’t touched on: Becoming a guest speaker yourself. Jeremy Koenig shared that it can sometimes be very difficult to secure a guest speaker. This is no reason not to hold a Webinar. Though having expert speakers is an added benefit, you can also round up your internal team or be your own speaker. In the end, it’s the content that matters. For MobileCause, and also for our team at AnyMeeting, one piece of the guest speaker strategy is seeking our customers with a success story. Koenig tells us that his team will reach out to several customers and maybe a few will agree to participate. What often goes unspoken is the impact the guest speaking spot has for the speaker’s business. Koenig recalled one speaker who was relatively unknown, but after joining their Webinar with over 1000 attendees had begun to see growth in their own business. Partnering with other businesses with a pre-existing webinar program could be a great way to launch your own webinar strategy to gain exposure and grow your business. It can also help validate any internal doubt you may have about launching a webinar program of your own. Successful companies hold webinars regularly, but preparing for webinars can be a daunting task if they aren’t part of your regular routine. While setting up a webinar, you may find there are lots of moving parts and it can feel like you are in a circus spinning plates. You are more likely to forget something important or host a subpar webinar if you don’t commit to dedicating the time and resources to get it right and check off all items on your list. Forgetting a single item on your checklist can cause anxiety, and honestly, we’ve all experience a few snafus. We’ve recently interviewed Webinar expert, Ken Molay, President of Webinar Success and combined with our own in house expertise; we compiled a Webinar Checklist. We hope this list will aid you in conducting glitch-free and engaging Webinars. To start, at AnyMeeting, we recommend giving yourself at least 30 days to create and prepare for a successful webinar. Review your webinar title & description and confirm date & time. Review your webinar registration/landing page to share with your audience! Pro Tip: Get this information to your marketing & sales teams ASAP so they can begin talking about your webinar to create buzz and get sign ups. Even if the webinar isn’t completely scripted yet; a few talking points of what to expect will go a long way. Schedule a time with your webinar team and presenter for a rehearsal. Pro Tip: Host this rehearsal at least one-week prior to your webinar. It’s imperative to make sure you understand your webinar platform’s controls, discuss introductions and hand-offs, and run through your entire presentation start to finish, especially if there are multiple presenters to adjust time allotments. Create a survey that attendees will receive at the end of the webinar. Send your speaker an outline of your standard webinar format so they know what to expect. Pro Tip: If hosting a pre-recorded webinar, it’s important to be transparent with your audience. Let them know you are playing a prerecorded Webinar so that you are available to answer questions throughout to offer a better, more engaging experience. Otherwise, your audience will figure it out and will be less likely to engage and may drop.. Pro Tip: For webinars with a large audience, have a dedicated moderator as most technical challenges and questions come during the beginning of a webinar while the Host is doing the introduction. For webinars with a smaller audience these roles can be combined. Share registration page through emails and social media posts. Blog post that provides an intro to your topic with a link to your webinar. Have speaker guest blog on other outlets and blogs to get the word out. Send promotional emails with call-to-action to register for your webinar. Conduct webinar rehearsal, platform walkthrough & technical test. Pro Tip: This is a good time to reiterate the timing of your transitions and poll questions or any details about the introduction. Send final reminders to your audience via social media & email about your webinar. Sign-in 15 minutes early to webinar platform. Once signed in, go over any last minute details while waiting in the “Green Room” before the Webinar begins. Press “Go On Air” to go live to your attendees. Send a Thank You email to those who had registered and attended your webinar. Pro Tip: Segment your email list between these two groups. Include both a link to a recording of your webinar as well as a Registration link for your next webinar. Write a summary of your Webinar on your company’s blog including a link to the recorded version. Share the blog summary of your Webinar through your company’s social channels and in your next email newsletter. Repurpose the content of your webinar, poll findings and audience questions to maintain a strong content pipeline. Last week, we hosted an educational, but entertaining talk about how to grow your business by closing deals more effectively using webinars; Andrew Bermudez, CEO & Co-Founder of digsy.ai and Costin Tuculescu, Founder & CEO of AnyMeeting. If you couldn’t attend, don’t worry. We’ve posted this Webinar online to view at your convenience. You can also click here to download a transcript of the webinar. We also encourage you to sign up for our next webinar, “Creating Compelling Webinars Using Expert Speakers,” on April 6th, 2017 at 11:00 AM (Pacific Time); featuring Tony Karrer from Aggregage. Learn the tips and tricks to getting top experts to speak on your webinar and attract larger audiences. Click here to register. Webinars are a fantastic way to market your business and establish yourself as an authority in your industry. But getting started can be a difficult and daunting task. While some companies just seem to have a great rhythm and lists upon lists of ideas for future Webinars; many of you may be struggling to come up with a single idea. This guide is intended to help you think critically about how you can come up with a Webinar topic, quickly. Look through content you’ve already produced. If you have a blog or active social media channel, you can repurpose a few of your posts to create a Webinar. This is a great way to go further in depth into a topic and to engage with your audience. Pro tip. Once you host this webinar you can repurpose your Webinar back into blog posts focusing on your additions or audience engagement topics to keep the ball rolling. Invite a customer to speak. Do you have a customer who just get’s it or is using your product in unique and powerful ways? If so, ask them to join you on a webinar. You can set this up in a variety of ways. You can ask them to do a walk through of how they use your product, set the webinar up as a Q&A or ask they to prepare something a bit more aspirational and weave your product into their story. Host a panel with experts in the industries of your customers. Your customers have many pains and needs outside of the scope of your product. Say your product is a CRM designed for pharmaceutical sales reps. Get a panel together with a top sales rep, someone from your executive team and maybe a doctor to share their expertise and take questions. Having a member of your team sitting on the panel helps gives your business more credibility by association and also helps to occasionally point the conversation to your product and the pains you resolve. Ask your customer service team’s advice. The fastest way to get a Webinar topic is to ask your customer service team what you should do. Chances are your support staff has fielded many questions and received lots of feedback on a variety of topics. There are probably many topics they wish your company has an official statement about. This will also show your customers that you are listening to them. Share Industry & Product Insights. Conduct a poll or survey about your industry and product. Then analyze the results and jot down a bit of commentary. You can host a Webinar where you share the results and your commentary live, then ask your audience to join in a guided discussion. Pro tip. Dive deep into your product’s usage data to see how customers are using your product. Are there any best practices from this data or are their any underused features that you wish to promote. Sharing insights into your product usage can lead to interesting conversations and aha moments for your Webinar’s audience. Have you seen a speaker in your industry, but have a slightly different take? Have you read an article from a competitor, but thought it was a little off-base or didn’t provide enough value? These are opportunities to join conversations that are already happening and already have an implied audience. Spend an hour researching what else is out there and come up with a unique position to talk about or simply aggregate a bunch of different positions to give your audience a 360 degree view of the topic. Pro Tip. Ask yourself what Thought Leaders or your competitors aren’t talking about. We’ve all had those questions in our heads that seems no one else has asked. Usually, we drop these from our minds. When it comes to a webinar, these are the perfect questions to answer. While they might be more research intensive as there may not be a lot of resources available; it’s almost guaranteed that your customers or potential customers have had the same questions. From Quora and Reddit to LinkedIn Groups and more, business leaders are always seeking for answers to questions they have about their businesses. Find out what these questions are and if you could answer them through a webinar. Pro tip. you can use these same groups to market your webinar. Send a quick reply in the discussion forum with a link to sign up for your Webinar to let everyone know you will be discussing that very topic. Explore ideas or early prototypes. It’s human nature to want to see something before anyone else does. It feels like a privilege. If your team is working on something new, host a joint webinar with your marketing, design and engineering teams to give a sneak peek into what you are working on. If you are still in early development, share wireframes, prototypes or sketches to entire and retain customers. Pro Tip. Construct this type of webinar in a way to get lots of feedback from your audience. Not only are you engaging your audience you will be able to improve your upcoming products and features with direct insights from your customers and prospects. Ready to host a webinar? AnyMeeting has pioneered small business offering a completely free, full-featured and easy-to-use webinar and web conferencing service tailored for small business users. start your 14-day free trial now. Sometimes you don’t think you have time to do it. Maybe you don’t see the importance in doing it, or just don’t know the best way to do it. But regardless the reason, following-up with potential customers after your webinar is vital to your business operation. Think about it: 24 hours after you wrap-up a webinar, you have the perfect opportunity to capture your attendees’ attention while the information is still fresh in their minds. AnyMeeting makes it simple to follow-up with attendees after a webinar concludes, with easy-to-use email and survey features. In the AnyMeeting application, you can email attendees to thank them for participating in your online event, share a link to the webinar recording, and close with a call to action and/or some sort of incentive. You can also send attendees to a survey directly following your event, to gain presentation feedback and get a sense of attendee engagement. So, what will you get in return when you follow-up? An opportunity to qualify webinar leads: Savvy marketers already know that in general, webinars produce highly engaged leads. But exactly which of your audience members are most interested in your product or service? Which are your best leads? You will know the answer to these questions once you receive responses from your follow-up efforts, and from there, you can determine which webinar attendees are the best leads to pursue. Attendee feedback – Using the AnyMeeting survey tool, you are provided the opportunity to gauge attendee demographics, ratings for the webinar presenter, content, and technology, plus any custom questions you may have for participants. It’s important to gain feedback on each of your webinars, so you can improve and evolve as a presenter, and determine the direction you’d like to go when it comes to online presentations. Webinar ROI: Ensure that time and money put into creating, promoting, and hosting webinars is worth your while. Are you attaining enough business to offset costs associated with webinar presentations? If, so, GREAT! Keep hosting webinars on a regular basis and watch your business flourish. If not, it might be time to figure out why, and work on your webinar presentation skills. So, you’re hosting a webinar using AnyMeeting! Awesome! Your presentation material is polished, you have completed the webinar set-up in the AnyMeeting app, and you are ready to lock-in some valuable attendees by promoting your online event. But where to start? With so many promotional tools out there, how do you maximize your reach in a timely manner, without the added cost? Your Email Contacts: This is the easiest place to start your webinar promotion. When scheduling your webinar, you can copy and paste your email list of your targeted audience…and just like that, your promotional campaign takes off! Your webinar is set-up, your people have been invited via email, and they’ll even receive reminders on the day of the webinar! Your AnyMeeting Public Profile: The second easiest channel to use for AnyMeeting webinar promotion is an informative landing page. Use your AnyMeeting Public Profile as a landing page, by directing potential attendees to this page (located in the Account Manager under the “Public Profile” tab — make sure it’s on the “public” setting). This is an ideal way to direct traffic to all of your upcoming webinars. As long as your mark your webinars as public when scheduling them, they will show up on this page with all the info your attendees need! AnyMeeting Social Integration Tools: While you are still in the AnyMeeting app, click on your AnyMeeting Public Profile tab to share and promote your upcoming webinars quickly and easily through Twitter and Facebook. Once the integration is set up, your scheduled webinars are automatically posted to your stream. How easy is that? LinkedIn: LinkedIn is an ideal place to promote your business webinars, and can be done so quickly and easily. You’re on there every morning anyway — why not drop a note about your upcoming event? Instagram and Pinterest: A picture is worth a thousand words — especially when it becomes viral. Snap a cool photo or create a catchy graphic that represents your webinar topic, load it with hashtags, event info, and your AnyMeeting landing page link, and voilà! Another’s Blog: To cast an even wider net, try promoting your online event by joining forces with a popular blogger in your industry. “Guest Blogging” is a great way to reach new potential attendees, and create relationships with other voices in your line of business. Video Channels: Periscope, Vine, and YouTube are fun and out-of-the-box channels for promoting your webinar. Using viral video tools, you can quickly create free promotional materials that are sure to get potential attendees’ attention. Think fad-like social media channels like Periscope and Vine are not marketing tools? Think again! Live and unedited promotional pitches show authenticity and creativity, and break up the monotony of traditionally written promotion that may be ignored. Your Email Signature: While it may seem too simple to be true, adding upcoming webinar information with a link to your email signature is a highly effective, and effortless way to promote your upcoming webinar. Think about all the people you exchange emails with on a daily basis who may click your link, or forward the info to a colleagues. Have any fun ideas to add to this list? Leave us a comment! Small businesses and non-profits are looking to grow their customer/constituent base, deepen their relationships with supporters and prospects, and influence people to take action. Online events such as webinars present an ideal opportunity because they allow you to share your presentation, video, and screen and provide audio commentary. You can interact with your audience and enable attendees to connect and at-tend your event from anywhere in the world. With this in mind, we have compiled 40 tips that address each stage of the webinar process and help ensure success. You can review and download the Free eBook here. 40 Tips for Webinar Success from AnyMeeting, Inc. Determine what they want: Poll your audience and find out what they’d like to hear about. Discovering where your clientele already understands your expertise to lie will help you to craft a webinar that plays to their perceptions of existing strengths. Especially if you work in a team environment, don’t plan your webinar topics without the input of the sales and marketing staff. “How To Plan Webinars That Work,” James O’Brien. Consider working with a partner: Sometimes the process of getting sufficient numbers of people to your broadcast can be a daunting one. Whatever your situation may be, the easiest way to get the viewers you need is by partnering with an individual or organization that already has a relationship with your target audience. “A Little Known Secret to Webinar Success,” Eric Brown. Decide who will present: From the start of your webinar planning, you need to think about what format your online experience might take. Will it be just you, as the expert, explaining a principle, or are you thinking that it would be best to bring in additional presenters — people who can broaden the field of knowledge? Note that you’ll need to administrate a group if it’s the latter. So, plan and build all the slides and audio material from every presenter into a complete package, early on. “How to Plan Webinars that Work,” James O’Brien. Pick an interesting topic: Create a solid theme and topic that will be interesting to attendees, and drive the message home. “First Time Producing a Webinar?” Lauren Tuculescu. Put together a solid slide presentation: In addition to creating a wonderful talk, spend as much as 20 hours building a simple and interesting slide deck to accompany it. Make sure they work well together. “10 Tips for Effective and Engaging Webinars,” Mark Di Vincenzo. Your slides should be visually appealing: While it is important that you provide engaging and relevant content through your narrative during the presentation in addition to the slides, be sure to have an interesting and visually appealing slide presentation. “Creating a Professional Webinar,” Jennifer Gregory. Identify a problem and a solution: Throughout your presentation, you should be hitting on hot buttons that identify common problems or frustrations. Grab their attention by making them feel like you’re talking directly to them, describing what they thought were unique challenges. Once they’re on the hook, offer up a solution: your products or services! “How To Sell With Webinars,” Angela Stringfellow. Give yourself enough promotional lead time: You’ll need some time to attract an audience to your webinar. The industry-recommended standard is about two to three weeks. Any longer than that and you’ll run the risk of having participants forget about the event. Any shorter and you may not be able to attract a large enough audience. “6 Tips for Hosting Your First Webinar,” Kate McFarlin. Don’t forget to send out reminders: Two days before the webinar, email a reminder with the specifics: date, time, URL, pass code and audio dial-in number. Note if the participants must download specific software or use a certain browser. Include a contact phone number in case of technical difficulties. Prevent last-minute chaos by familiariz- ing yourself with the webinar system well before the event. Plan to log on early the day of the webinar to make sure everything is working well. “9 Tips for Better Webinars,” Julie Bawden-Davis. Make sure everyone has what they need: When working with a large online group, providing the attendees with necessary documents prior to the meeting is essential, unless breaking or bad news — like corporate down- sizing or mergers — is being shared. If it’s simply a sales plan or projections, send the slide presentation or accompanying files ahead of time. This will help attendees come prepared, with questions already formulated, which will help with interaction. “Five Ways to Prevent Boring Webinars,” Angela Stringfellow. Remember what you want: Before you start marketing your online presentation, make sure you know why you’re doing it, what you’re trying to accomplish, and what you hope attendees will get out of it. “10 Tips for Effective and Engaging Webinars,” Mark Di Vincenzo. Choose your audience wisely: Invite the right people. If 100 people attend your webinar, but very few of them are the target audience, then your webinar will not achieve the goal you set. “How to Use Webinars for Lead Generation,” Jennifer Gregory. Find those with a common interest: Think about the individuals or groups that already have relationships with the people you want to reach and come up with ways to partner where everyone can walk away a winner. “A Little Known Secret to Webinar Success,” Eric Brown. Flap your wings and Tweet: Although Twitter restricts posts to just 140 characters at a time, it can still be effective for tweeting links to your seminar’s Web page. To take full advantage of Twitter, learn to exploit the power of hashtags. Twitter hashtags are code words (preceded by the “#” symbol) that designate your posts for keyword searches. For instance, if you include the hashtag “#webinar,” in your tweet, anyone searching for that hashtag will see search results that include your tweet. “Using Social Media to Promote Your Webinar,” Robert Hadley. You’ve got mail: Email is still effective, as long as it does not appear annoying or “spammy.” Having a special guest speaker for your upcoming webinar is a great way to encourage registrations. An influen- tial speaker will generate buzz, enticing and exciting potential attendees. If chosen appropriately, this guest speaker aspect is a promotion in itself. “Using Webinars to Promote Your Business on a Tight Budget,” Lauren Tuculescu. Decide who will facilitate your event: A webinar facilitator can be of assistance in terms of advising you on ways that you can have a high marketing reach by reaching out to groups, organizations and other contacts to draw individuals into the webinar, “5 Tips for Using a Webinar Facilitator to Generate Leads and Customers,” Heather Butts. Enlist the help of your colleagues: If you have brand ambassadors — key employees who can spread your message — make sure they post the webinar link in their status updates and share it in any relevant groups they belong to. Different groups have different rules about promotions, so it’s a good idea to either consult the rules or email the moderator for guidance. “Using Social Media to Promote Your Webinar,” Robert Hadley. Select the right ticket price for your audience: Before deciding on the price for your webinar, spend some time researching what other people are charging for similar webinars in your industry. “Tips to Monetize your Webinar,” Jennifer Gregory. Use registration as a marketing tool: As part of the registration process, have one required registration question for future marketing purposes (example: How did you find out about this webinar?). “7 Tips for a Successful, Pitfall-Free, Lead Generating Webinar,” Heather Butts. Testing, Testing, 1,2,3: Before starting any online event, it is always a good idea to test out your equipment and make sure it runs properly a day or two before you go live. “Everything is Working Correctly Right? Are you Sure?” Bob Menzies. Three words – practice, practice, practice: One of the secrets to keeping the audience’s attention is to appear confident, knowledgeable and professional. You should also make a conscious effort to eliminate annoying speech habits, such as the dreaded “um” and “eh” disease. “The Secrets of Engaging Webinars,” Jennifer Gregory. Eliminate distractions: Before the webinar begins make sure that you eliminate all distractions that will be audible or visible to your audience, such as unnecessary computer programs running on the screen and personal items in the background. Make sure that you keep kids, dogs and co-workers out of the room where you are hosting the presentation. “Common Webinar Mistakes and How to Avoid Them,” Jennifer Gregory. Look like you know what you’re doing: If you are using video, be sure to dress professionally, just as you would if you were in the front of a conference room. Check that everything visible on the webinar presents the image that you are aiming for. “Creating a Professional Webinar,” Jennifer Gregory. Don’t forget to hit record: Be sure to record the webinar and edit the recording after the presentation. “How to Use Webinars to Generate More Sales,” Tom Treanor. Make sure everything is set: At the start of the meeting, make sure that all participants can see the screen or slide and that the audio is working properly. Quickly review how to use features such as chat. Lay the ground rules for asking questions and completing any polls. “9 Tips for Better Webinars,” Julie Bawden-Davis. There’s a poll for that: Starting at the beginning and throughout the online presentation, encourage interaction with attendees through on-line polls, quizzes and by opening up the floor for questions. Offer incentives for participation, such as raffle prizes. “8 More Tips for Effective and Engaging Webinars,” Julie Bawden-Davis. Your body language says it all: Make sure your body language is good – posture, smile, and use of your hands while speaking. Don’t pace or have other distracting movements. Also, make sure your tone is the right volume and pace. You want your audience to hear you and be able to understand what you are saying, especially when dealing with video conferencing technology. “Tips and Guidelines for an Effective Video Presentation,” Anna Brown. The results are in: Conduct polls and share the results as soon as they’re in. Polls are a great way to involve everyone in the online meeting, and they can be used to transition into or out of a topic. “10 Tips for Effective and Engaging Webinars,” Mark Di Vincenzo. Failure is not an option, but it happens: If audio fails for more than 30 seconds, have a slide available to alert the audience as to what is going on – but don’t apologize excessively – technical issues can happen. “7 Tips for a Successful, Pitfall-Free, Lead Generating Webinar,” Heather Butts. Share the recording: After the webinar, post the recorded version on your website for people who were unable to attend and for attendees to re-watch. You can also send links to the webinar to potential new customers to share the information presented and build interest in future webinars. Be sure to encourage attendees to share the link with co-workers and other professional contacts. “My Webinar is Over, Now What?” Jennifer Gregory. Remember to thank your attendees: Webinar attendees want something in return for their attention and participation. So after the webinar ends, email a thank-you note to attendees, and include some tips related to the topic. “10 Tips for Effective and Engaging Webinars,” Mark Di Vincenzo. More follow up may be necessary: You’ll want to set up a series, maybe 2-3 emails, that include not only the recording but also any other content that would help your attendees better understand the material that was presented and make that decision to buy your product or sign up to your service. “Post-Webinar Email Funnel,” Jay Moore. Follow up and/or respond quickly: If somebody has questions or says “I would like more information,” during the webinar and you get back to them that same afternoon, that is very powerful. “How To Put On A Killer Webinar,” Ken Molay. Decide who will handle answers to questions: Assign someone to coordinate the questions and answers that are raised during the meeting and to get them to the participants as soon as possible. There is nothing more frustrating than being told that the answers to the questions presented will be emailed shortly, then nothing comes. Following through with requests and sometimes demands, will build trust among the participants and they will be more willing to participate again. “5 Ways to Prevent Boring Webinars,” Angela Stringfellow. Post webinar presents marketing opportunities: Always follow up after the webinar. Decide how you are going to use your webinar recording for marketing purposes. “7 More Tips for a Successful, Pitfall-Free, Lead Generating Webinar,” Heather Butts. Find out who attended your presentation: Once the webinar is over, you’ll want to go over the registration/ attendee rates. How many people registered and how many people actually attended? From there it is imperative that you follow up with the individuals that registered but did not attend, ideally with a recording of the webinar very soon after the live event. “5 Tips for Using a Webinar Facilitator to Generate Leads and Customers,” Heather Butts. Reach out to your prospects: Your post-webinar emails should encourage prospects to start a trial of your product or service. These emails and calls to action can consistently generate new orders that likely would have slipped through the cracks without proper follow up. “Post-Webinar Email Funnel,” Jay Moore. Survey says: An important step of following up is to send a survey to all attendees with specific questions about your webinar. “My Webinar is Over, Now What?” Jennifer Gregory. Take time to reflect on your performance: After the webinar is over, take some time to recap what worked and what didn’t work to help improve for next time. “Tips to Monetize Your Webinars,” Jennifer Gregory. Implement these 40 tips to help get more out of your online events and webinars, andbe sure to use a reliable webinar service that is built for small business, like AnyMeeting. To learn more about AnyMeeting and select a plan that’s right for you, visit http://www.anymeeting.com. If you’re looking to grow your small business with digital marketing – this webinar is for you! 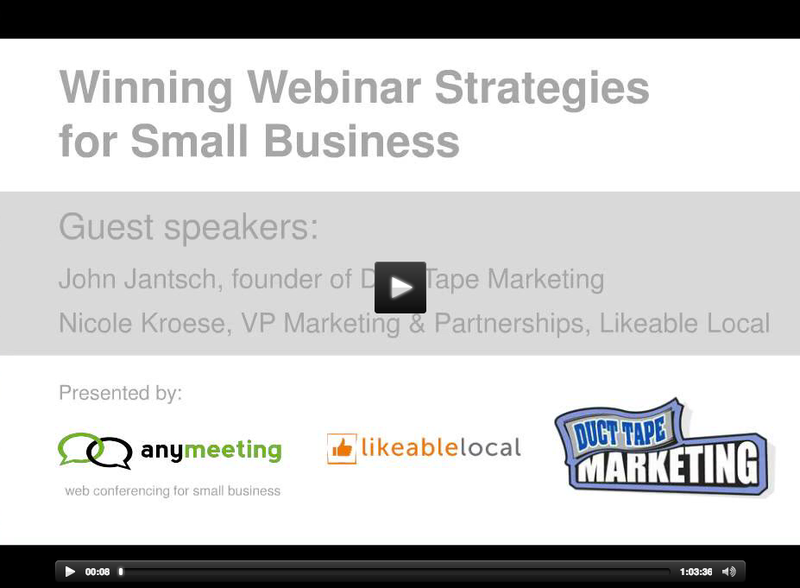 Watch this webinar featuring John Jantsch, Founder of Duct Tape Marketing, who discusses the many ways you can use webinars to help grow your business. John is followed by Nicole Kroese, VP of Marketing at Likeable Local, who shares tips on how to use social media to build your webinar audiences and expand your relationship with registrants afterward. Watch the entire webinar now! Winning Webinar Strategies for Growing Your Small Business from AnyMeeting, Inc.
To check out additional webinars and sign up for our next session – check the schedule here. Producing great content that appeals to people beyond your established audience is an increasingly vital part of the marketing mix. But contrary to what some might have you think, doing it successfully doesn’t have to be big budget and it doesn’t have to be massively time consuming. Here are five ways small businesses can produce and promote great content. Meetings of all kinds produce a wealth of interesting content which is often cast aside after it has been used for its original purpose. However, with just a little bit of re-purposing it can be given a new lease of life. If someone makes a presentation on how they managed to generate a 30 per cent increase in organic traffic, why not take their slides, tweak them if need be, and then upload them to a service like Slideshare so other people can learn from your expertise? Success stories of any kind always attract views and shares. You just have to decide how much you want to tell people. A large part of a successful content marketing campaign is finding people who are willing to share what you have to offer. But most small businesses already have a network of contacts who only need a little encouragement to pass on your wisdom. It’s just a case of making it worth their while. The best way to do this is flattery. To go back to our first example, if your SEO success was achieved with the help of a particular tool, let the company in question know about the slideshow you’ve created and that it mentions just how great their product is. This means they’ll be more likely to share it with their audience, exponentially increasing the reach of your presentation. If you can create valuable content that is relevant to your all your business partners, then you should make some big gains that are hard to beat. Want international media coverage and thousands of websites linking to you? All you have to do is fall down a sinkhole and then have your wife write about it like the crew at Golf Manna. Admittedly, that’s a little bit drastic but it goes to show you never know how interesting what happens in your company will be to other people. Don’t expect everything you do to go viral, but what might seem like an insignificant event in your company’s day-to-day life can often be turned into something more interesting. If you’re running a charity event, make sure you tell the local press about it. You might end up with some coverage (be sure to ask for a link back to your website if they run the story online) but you’ll also gain a valuable contact in the form of a local journalist who can promote your future successes. You can also contact the charity you’re raising money for and offer to provide them with photos of the event so they can feature them on their site. None of this may feel like marketing in the traditional sense, but it is a valuable way to increase awareness about your company. If you don’t have the budget to invest in monthly subscriptions for the leading content marketing tools, track down the free alternatives and make the most of them. Buzzstream, a package which allows you to identify people who might be interested in publishing contact you’ve created and track your relationship with them, offers a wide selection of free tools which can be used to start a basic content marketing outreach programme. The SEOMoz toolbar, which is also free, can be used to evaluate whether it is worth your time trying to get a site to link back to you. A guide on how to use the metrics you’ll see can be found on the SEOMoz site, as can a huge archive of valuable tips and how-tos. These free tools can be used in a very basic way – to help you track down people who might be interested in promoting your content and to see how powerful their site is, both vital parts of content marketing. Content marketing can be made easier, but it can never be made simple. There are a huge number of pitfalls awaiting the unwary small business taking its first steps into the world of content marketing. Stay away from lost cost packages that promise cheap articles or a huge number of links – they’ll do you more harm than good. You should be proud of the content you create and promote and if you’re not then you shouldn’t expect other people to be interested in it. Companies that have met with success on any scale have a lot of useful information to share and it’s this, rather than articles that cost a penny a word, that will help extend your reach as a business. Guest post written by Will Stevens of 123-reg a provider of domain names and cloud hosting services. 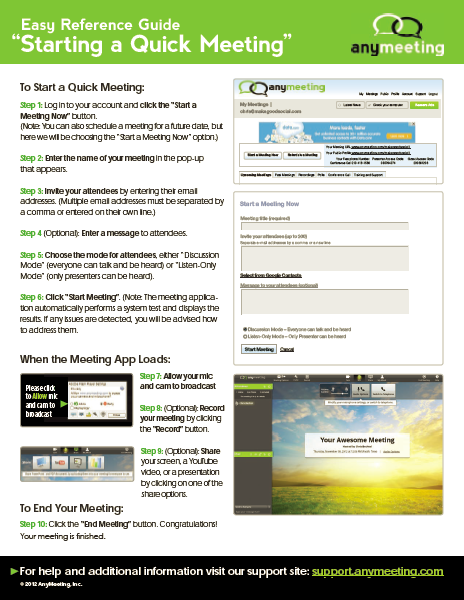 New to AnyMeeting web conferencing for small business and need to launch a meeting fast? Check out our new Easy Reference Guide for Presenters. Download it and keep it handy for when you need to launch a meeting fast. Choose the mode for attendees, either “Discussion Mode” (everyone can talk and be heard) or “Listen-Only Mode” (only presenters can be heard). Record your meeting by clicking the “Record” button. Share your screen, a YouTube video, or a presentation by clicking on one of the share options. Download the Easy Reference Guide for Presenters: Starting a Quick Meeting Now.